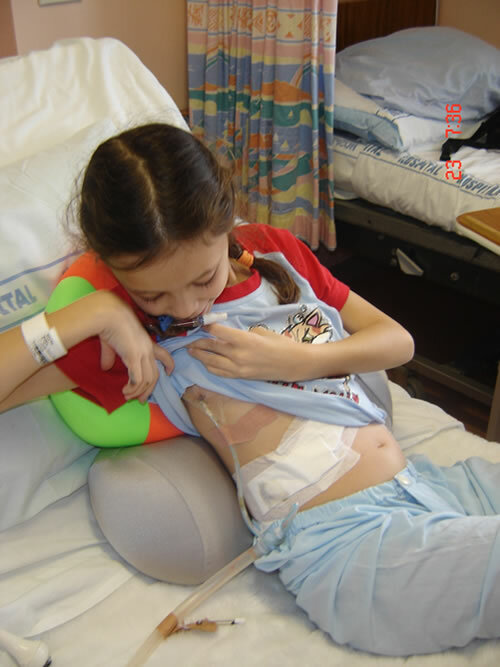 I was healthy and happy growing up in Auckland until I was 9 years old and I found a lump on my side by my ribs. Mum took me to the doctor who sent us to Starship Hospital where I had several scans and tests before the doctors told us that they had found a very large growth on my liver and they didn’t know what it was. Doctors decided surgery was the best option - to remove the growth and test what it was, and a date was scheduled 5 weeks later. By the time of my surgery I was really really sick, very weak, I was in a wheel chair as I couldn’t walk and was in a lot of pain. The liver surgeon from Auckland Hospital took 7 hours to remove the tumour along with 70% of my liver and my gall bladder. After a few weeks, the big wound across the front of my ribcage and up the middle of my chest bone started to heal and I was feeling better when we met with the Starship surgeon to hear the results of the tests on the growth. But it was bad news. I was diagnosed with a very rare cancer undifferentiated sarcoma of the liver. We went directly up to level 7 at Starship - the Oncology ward - and met Ruellyn Cockcroft, my Oncology Specialist and she spoke to my mum and dad about a treatment plan. Fourteen rounds of chemotherapy over a year. The treatment began immediately. Each of the 14 chemo treatments took about 5 days and it would make me very sick, so that even in between treatment I would still be in hospital. The nurses and doctors at Starship were really nice and there were lots of sick kids just like me. While I was ill, my family and I got lots of support and this really helped us cope. I got lots of amazing letters and cards from everyone. Parents from my school at St Michael’s provided meals and helped look after my little sister, Noon. I remember during my first chemo treatment, the Child Cancer Foundation lady bought me a big stuffed Pink Panther and a really comfy patchwork quilt which I used all the time in hospital. Later, the people at Make-A-Wish gave me an awesome laptop computer and a family friend gave us a mobile modem so I was able to keep in touch with my friends while I was in hospital. Mum had been a volunteer with the Friends of Starship for a few years and so everyone involved with the Friends and Starship Foundation were really good to us. Near the end of my treatment I was lucky to be invited by Koru Care to go on their 16 day trip to LA and Disneyland in November 2007. They were leaving just 2 weeks after my final treatment and thankfully I was well enough to get on the plane. It was the best holiday I ever had! Then, Cure Kids took mum and me to Queenstown for a weekend with a bunch of other sick kids and actors, Renato Bartolomei and Craig Parker came too and they were lots of fun. After almost a year and a half out of school, I started college as a Year 7 student. It was so good to be back with friends and doing normal things. I am now very well and clear of cancer.